The past has always been a parade. I come around a corner and there it is. When I’m with someone I know well or when they come to mind traces of our past fly about between us. It’s also this way in the case of artists whose work is well-known, especially those who've put themselves into their work. There's a pageant of them too. I’m looking at photographs of Ernest Hemingway’s Cuban home taken some time in the 50’s. 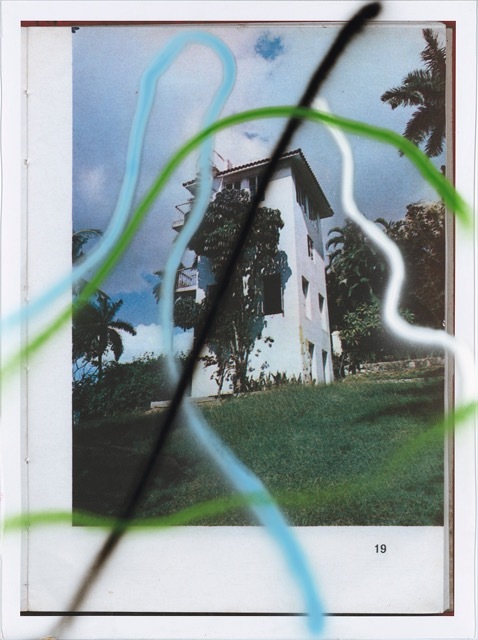 Over a photo of a tall, white, tower-like house under a blue sky lines of spray paint run across the image and onto the frame. The painted lines are not on the image. They’re in me. I’ve never been to Cuba but the white house is one I’ve lived in. The blue line soaring up and dipping down is the love I felt for the two sisters who lived next door - an easier love to be thrilled by than the implacable love for my own four sisters. I learned how to be held off while holding on. Though always alarmed by them I learned to let go and the blue line became the green line: a gesture in the heart. Any piece of fabric that color of blue recalls the two silent teen-age sisters. The white line is separation - a break in the flow of time when things come apart within the house. The black line is my attempt to forget what I lost and how tired I’ve become of reenacting loss. The black line is the most barren line. Then this happens: “Papa, Papa.” I’ve dropped the keys, muttering to myself. It’s late. Drove back from hours at the Floridita in Havana. The house is encased in night as I step into it. I’m greeting myself. Strange towering house. If the house is anthropomorphically the body, I am the house standing at my desk writing every morning. A faint blue and a brown line appear as I enter. Spain and Cuba entwined. I'm here, holding onto Spain. A passage away. The dawn sun rakes across the floor and the positioned furniture. Two armchairs and between them the table which give the stage it’s dimension. Rows of bottles stand in order, re-armed, last night’s drops wiped clean. Bloodlessly I told Mary she must re-arrange the trip. As I stand at the entrance to the room jousts, refusals, admonishments, trace across it, dissolving at their edges. The exchange still rings through the room obscuring the furniture and pictures. Green plumes. Even the serene moment has an orange storm beneath. I’ve dimmed all but one or two lights in myself, but there is, below the surface, clear cold water. The channel is still open. I can write here which is good. Dreams can convince us that we are about to die, that we can fly, that we can speed, slow and leap through time. Time and reason have no sequence. Speech is non-sequiturs. Dreams break right into reality - newly sober you awaken convinced that you took the full glass and drank it. You feel regret and shame which clear into great relief when you realize you didn’t! It was a dream. The painted lines running over the plexi and onto the frames are wrong like that. And then they become right and open the possibility that they are remnants of dreams. Or maybe they’re interpretations of dreams, events or conversations that already happened. The spray paint reads like an inscription. They’re epigraphs, poems to a mythic artist, (or mythic artistry or the myth of artistry) in gestures and colors. They’re also pictures of a relief - creating a dimension that sits somewhere between the photo and anyone looking at it. Closer to us than to the photo, suggesting our power. Colors awaken the empty bedrooms, bathrooms and terraces. They’re no longer a set, not pictures anymore, they've become the next stage which is the story, the far more durable, lifegiving version which happens as memory selects and re-draws events and it gets written down or painted. The painted lines tell stories. They look like code for something going on in the life of the house, in the life of Hemingway, his wife, their family and guests. Maybe they tell the story of Hemingway’s enjoyment of his sons, his tremendous enjoyment of life and the suddenness with which that easily died, nearly every day. A story in red volleys off close rackets within us. Are these paintings the shapes of fiction or shapes of everyday life? Maybe Julian's painting what’s there as he’s seeing it. What appears as he paints. Like in a dream.